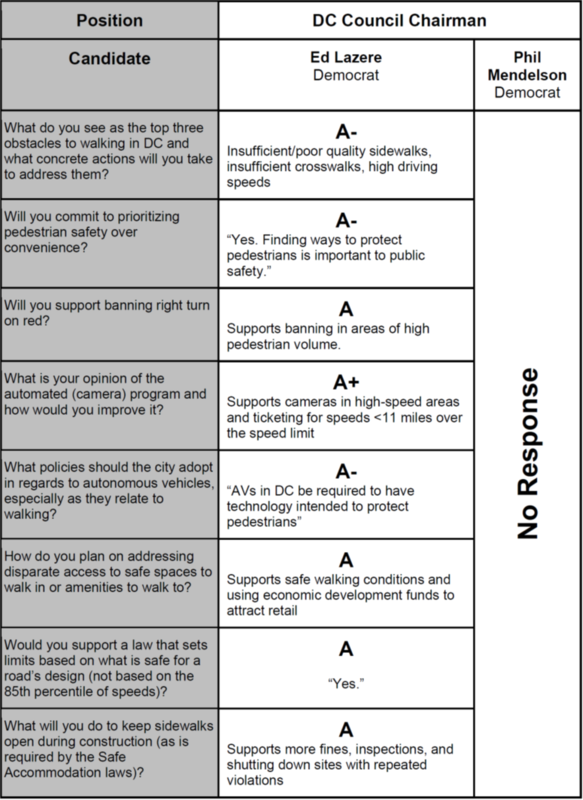 Which candidates are willing to walk the walk for pedestrians in DC? 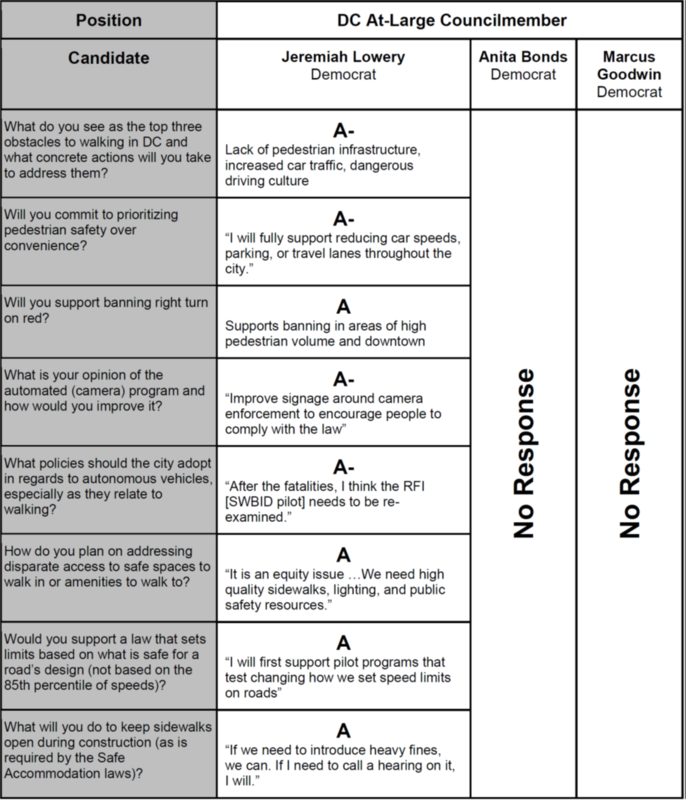 To find out, All Walks DC sent a survey to all registered 2018 DC candidates, asking questions covering autonomous vehicles, traffic speeds, automated (camera) enforcement of traffic violations, right turn on red, access to great places to walk, and more. 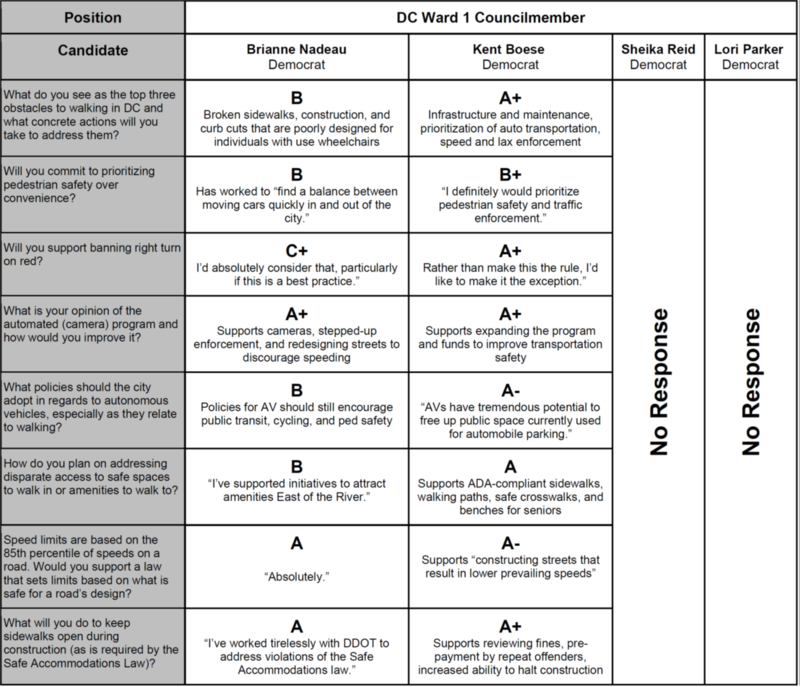 We are pleased to release the 2018 scorecard rating candidates’ responses to the questions. Remember to vote in the primary election on (or before) June 19, 2018! 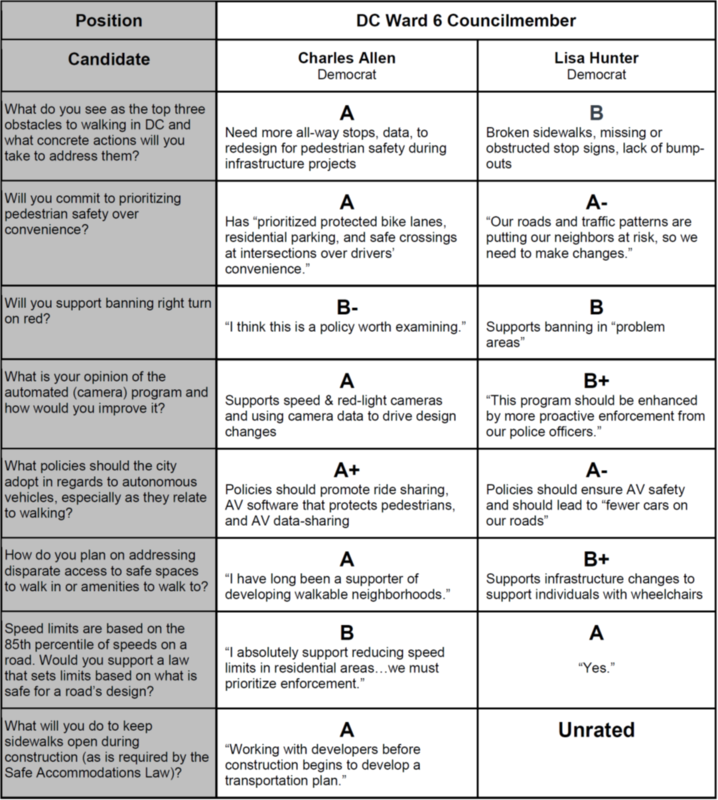 The following section offers highlights of candidates’ responses and the letter grades we rated their full responses in prominent primary races. Click here to read the full text of the questions and candidates’ responses. All Walks DC advocates for citywide solutions to make the District of Columbia a place where walking is celebrated and respected as a basic human right. Everyone is a pedestrian. Walking is the most universal and accessible mode of travel in DC and is essential to quality of life. Our top priority is safety. All Walks DC believes we can create a city where there are zero pedestrian injuries or fatalities through changes not just to our infrastructure but also to our shared culture around how we live and move in the city. We seek to engage our elected officials, agency leaders, and police to join us in building a sense of urgency on behalf of the safety and convenience of pedestrians. Pedestrians First: Every DC street should prioritize pedestrian accommodation first in design, traffic laws and enforcement. “Vision Zero”: We seek a world in which no pedestrian injury or fatality is inevitable or acceptable. Transparency: We call on our police, transportation, and public health officials to share information about traffic violations and collisions in a public and timely fashion.